At previously, we have received many inquiries from our customers, they need to do mirror polish for their stainless steel machined parts in order to make their parts appearance better. The mirror polishing we will ask parts material is harder such as stainless steel is best choice to us, since when we have polish parts appearance, we will have to use silver sand or grinding wheel to remove parts surface of texture or flatness, so we will get final parts surface of degree of finish like mirror. so we usually called it with mirror polish process. Today, we will share a few knowledge of mirror polish for stainless steel machined parts. By this learn, you will have a certain understanding of mirror polish process, and why we have to do it in our daily life. What’s mirror polish process of stainless steel machined parts? 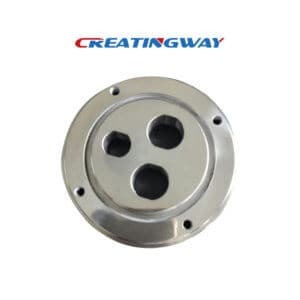 In fact, the mirror polish process is one of surface treatment for metal machined parts, it depends directly on the height of the finish, which is directly interpreted as mirror like smooth, Ra0.2 or parts surface finishing level is 0.005 or more less, so we have to use grinding wheel to make this surface more smooth. At present, mirror polish process is divided into mechanical mirror polishing and chemical solution mirror polishing. It’s a smooth and bright surface that like a mirror-like surface through grinding process (coarse grinding, fine grinding) and polishing process on the metal materials. The purpose of polishing is to obtain a smooth surface. At this time the grinding surface still has very fine and uniform abrasion marks. At present, the grinding is divided into coarse grinding and fine grinding. Fine grinding- After coarse grinding process, the surface of the metals still have deep abrasions that need to be removed in fine grinding to prepare for polishing. Polishing process is to obtain the surface process of the bright mirror. Most of the parts used in polishing wheel to repeat polish many slightest injustice on surface of the parts. At the same time, polishing is also the last process of the surface of the coating or the surface of the parts. The purpose is to remove the fine scratches that remain on the surface after the polishing process. The ideal polishing surface should be flat, shiny, indented, no relief, no pit and metal disturbance layer like mirror surface. By grinding and polishing process, the surface of the parts will also be changed. Function: It’s mainly to clean and remove stainless steel ( Such as: screw, hang piece, hardware and decoration etc), cold rolling. stamping process produces the oxide skin to keep bright and beautiful. Advantages: Chemical polishing, rapid and convenient, economical and efficient, and more than the market similar products. Function: Using for stainless steel fasteners, fishing gear accessories, chain, pendant, spring and hardware etc. After these stainless steel machined parts processing, and compared with stainless steel drum polishing liquid, its acidity is stronger, and more suitable for polishing with rough surface oxide layer or value higher artifacts. Advantage: Improving the surface brightness of the stainless steel machined parts, and made the parts bright and perfectly. And the combined with mechanical and chemical polishing, the economy is efficient and the brightness is good. What kind of material is best choice to do mirror polish? The stainless steel is harder, so if we will use this material to do mirror polishing, then this final effect will be better. In here, there is one issue for parts tolerance after mirror polish, we have to do it bigger, we usually do it +/-0.15mm. The mirror polish parts will be more suitable to some of appearance parts but feature parts, so most of customers can accept this tolerance.